In this memoir, Ken Ilgunas lays bare the existential terror of graduating from the University of Buffalo with $32,000 of student debt. Ilgunas set himself an ambitious mission: get out of debt as quickly as possible. Inspired by the frugality and philosophy of Henry David Thoreau, Ilgunas undertook a 3-year transcontinental journey, working in Alaska as a tour guide, garbage picker, and night cook to pay off his student loans before hitchhiking home to New York. Debt-free, Ilgunas then enrolled in a master’s program at Duke University, determined not to borrow against his future again. He used the last of his savings to buy himself a used Econoline van and outfitted it as his new dorm. The van, stationed in a campus parking lot, would be more than an adventure—it would be his very own Walden on Wheels. I have mixed feelings about Walden on Wheels. I’m going to do something different and start with my negative thoughts. (Stick with me folks cause I promise it ends on a happy note) First, Ilgunas and I have different political views. Now, I can totally respect that difference but there were a few times the overly idealized, judgy, and often conflicting comments by the author were a tad irritating. Nothing that made me want to throw the book down in anger, but elicited frustrated eyerolls at certain passages. I enjoyed the book. I felt Ilgunas was able to look at his journey in a constructive manner and focus on bettering himself. I found his accomplishments impressive!Ssure he may have used a jobless guy living in his van who dumps is piss bucket at stoplights as a roll model (seriously!?) but Ilgunas rose above continuing to work, feeding himself, and finding jobs where he could help people. Walden on Wheels is a story of a man coming to age. A kid watching the world around him, terrified of being trapped in a soul sucking existence with no adventure. And that is something in which I can relate. I will admit to struggling through a couple of days of depression while reading Walden on Wheels. Why am I working a job just to pay bills? Why, oh why, did I take out all those student loans? Where can I buy a van? See, my husband and I have discussed the possibility of van camping a number of times, and I was ready for us to cash out and just go. But after multiple cups of coffee, and a reevaluation of my goals, I decided that I’m right were I need to be at the moment. Instead of quitting my job and hitting the road, I decided that it was time to just be better with my money. To count pennies as Ilgunas had. And I decided to focus on my hobbies, whether it be flying, hiking, or just reading a good book curled up on the couch. It was time I took more joy from the things that make me truly happy. It was time to go outside and reconnect with nature. 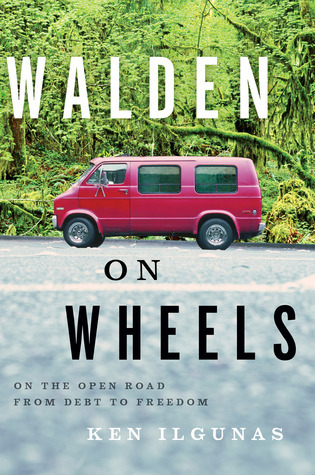 Give Walden on Wheels a read. It will make you think about your own life. No matter your political views or socio-economic opinions, personal evaluation is usually a good thing. And it will make you laugh! I hope you’re enjoying your holiday reading. Let me know if you’ve read Walden on Wheels, or any of Ilgunas’ other work.